I know this is the quilt for someone. This was my center piece. However, I didn't like all that yellow in one place, so I ended up chopping it up a bit more as I continued to add to it. Maybe you can "find the center" in the finished quilt! 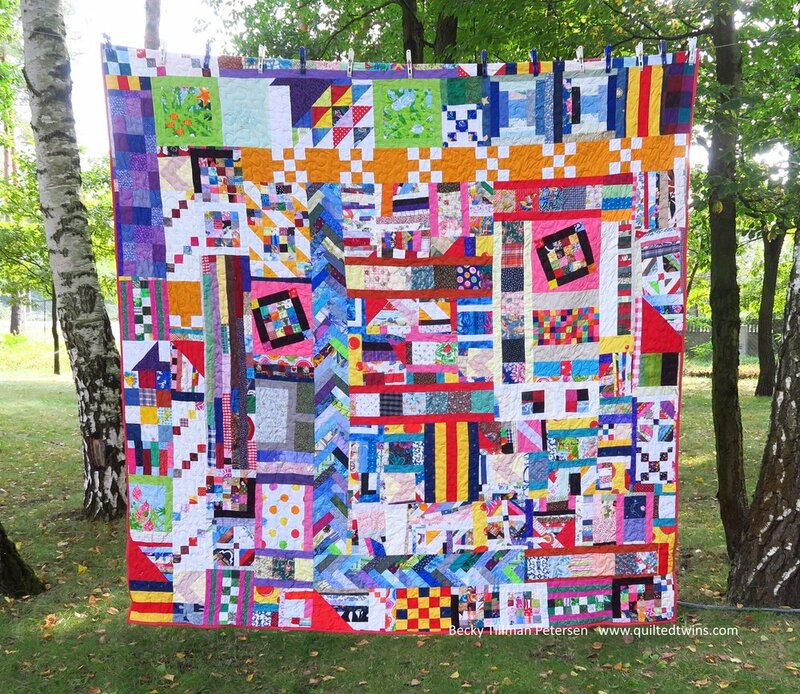 It is really quite a simple quilt. I took my orphan or leftover blocks or pieces that were finished already along with some scraps. I sewed them together and trimmed to make long strips which were three sizes - 3.5, 6.5" or 9.5" - and added them to a center piece. I went round and round the center. I added and added until it was approximately 100"x100". I varied the size of the strips as I went around so that I didn’t go on all four sides with the same size strip (for example, I sewed on a 3.5” on two sides and then 6.5” on the other two sides”). I knew it wasn’t square though. I was working with some strange shapes and even though I had tried to keep it more or less square by using strips, I knew things had gotten wonky on me. It just looked like it to me! 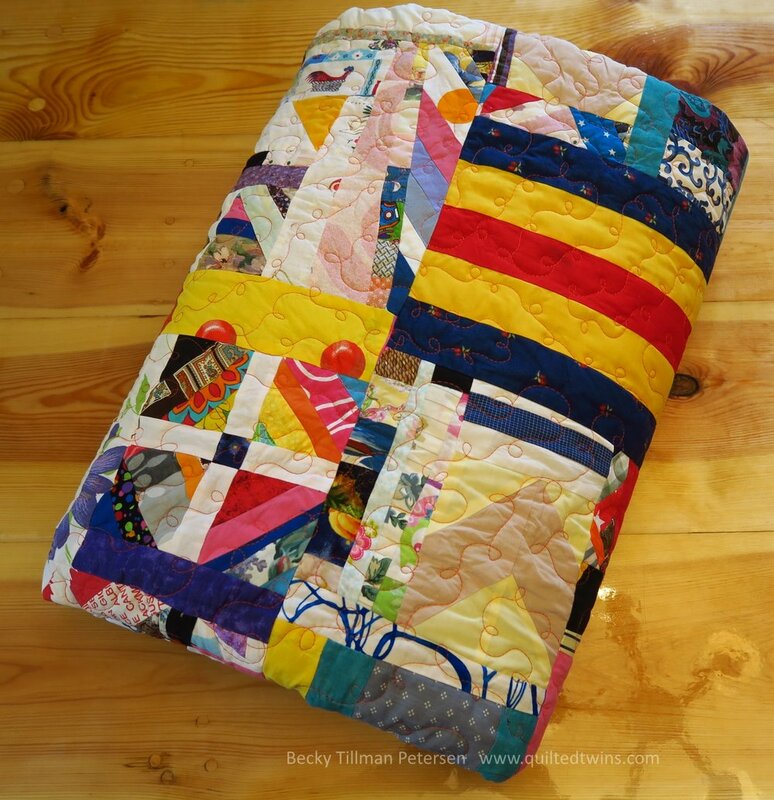 I went ahead and sandwiched and quilted it, however, and then I squared it up so it would be not out of whack, off kilter or 95” in one place and 100” in another! However, after quilting and trimming, it was 94"x94.5". I'll be explaining how I squared it up soon! Look for it on a different day. This floral is a color I find uninspiring! 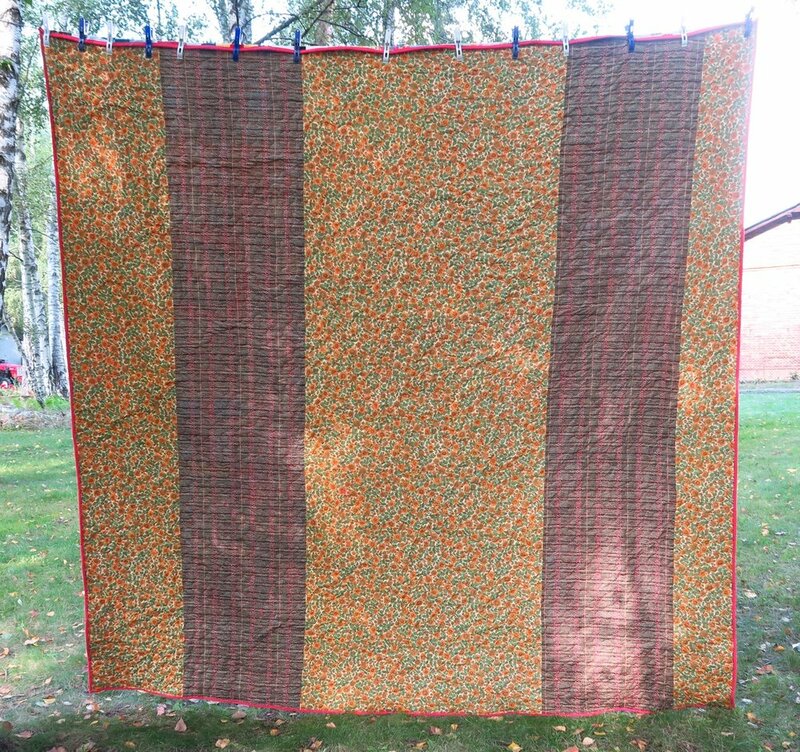 I quilted it with orange loops simply l because I have a lot of it, having bought a "lot" of embroidery thread on Ebay and got quite a few spools of orange in it. II don't use a lot of orange normally. I figured this was a good time to use some of it up! I bound it with a solid red - even though part of me wanted to continue the madness with a scrappy binding. Another part of me said, “No, use this.” So I went with the red. While I think, overall, the quilt is interesting, it frankly, isn't "my style" at all. I’ve told my sis it’s okay with me if we use it as a give-away for the QT business. At least the pieces will do someone more good than sitting in a plastic bin in my house! That’s where most of these pieces came from! And that's what's been happening from my sewing room! Have a great day, wherever you are reading this! Be sure to check out what my sis has for you over in the store! She's working hard to keep you in interesting fabric!